Sultan Bahu (ca 1628 – 1691) was a Muslim Sufi and saint, who founded the Sarwari Qadiri Sufi order. Sultan Bahu belonged to the Awan tribe, and was born in Anga, Soon Valley, Sakesar (Vadi-e-Soon Sakesar). Like many other Sufi saints of South Asia, Sultan Bahu was a prolific writer, with more than forty books on Sufism attributed to him. Most of His books are in Persian. However, most of his books deal with specialised subjects related to Islam and Islamic mysticism; it is his Punjabi poetry that had popular appeal and made him a household name in the region. His verses are sung in many genres of Sufi music, including qawwali and kafi. Tradition has established a unique style of singing his couplets. The mausoleum of Sultan Bahu is located in Garh Maharaja, Punjab, Pakistan. It was originally built on his grave. However, the mausoleum subsequently had to be moved twice when the Chenab River changed its course. It is a popular and frequently-visited Sufi shrine, and the annual Urs festival commemorating his death is celebrated with great fervour. The Urs festival is held during the month of Muharram. Every year on the 9th of Muharram (Islamic calendar month) a ghusal is also conducted under the supervision of Muhammad Najeeb Sultan (Sajjada Nasheen (Chair-holder) of the Sultan Bahu shrine), in which all descendants of Sultan Bahu wash his shrine with pure rose water. Sultan Bahu belonged to the Qadiri Sufi order, and later initiated his own offshoot, Sarwari Qadiri. Sultan Bahu refers to Muhiyuddin Abdul Qadir Gilani as his spiritual Master in a number of his books and poetry, but it is obvious that this relationship must have existed purely in the spiritual domain, as Abdul Qadir Gilani died before the birth of Sultan Bahu. 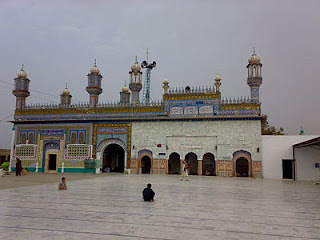 However, a majority of Sufi orders and saints maintain that Abdul Qadir Gilani has a special role in the mystic world and thus all orders and saints are always indebted to him directly or indirectly in some way. Sultan Bahu's education began at the feet of his mother, Mai Rasti, who was herself a saintly woman, and has her own Mausoleum in Shorkot, Punjab, Pakistan. She told him to seek spiritual guidance from a wali (friend of GOD). After some time, he moved to Delhi for further 'polishing' under the guidance of Sheikh Abdul Rehman al Qadari. Soon Sheikh Abdul Rehman al Qadari felt that he can not add anything to Sultan Bahu's knowledge as Sultan Bahu already knew more than Sheikh Abdul Rehman al Qadari. This did not take long, after which Sultan Bahu returned to his own, familiar surroundings. Sultan Bahu was of the progeny of Ali, cousin and son-in-law of the Islamic prophet Muhammad. His family is thus Hashemi, and his tribe Awan. The Awan tribe trace their ancestry to Ameer Shah, son of Qutub Shah. After the incident of Karbala, the household of Muhammad had to migrate to other lands. Many of his descendants who lived in Egypt and nearby lands departed for Turkistan and Iran due to persecution at the hands of Hujjaj bin Yusuf. As time went by, they resettled in places such as Bukhara and Hamadan in Turkistan, and Baghdad in Iraq. Some migrated to Khurasan and others to Herat in the mountainous regions of present day Afghanistan. The ancestors of Sultan Bahu migrated and settled in South Asia, and the father of Sultan Bahu, Bazid Muhammed, became an important titleholder at the court of the Mughal emperors of South Asia. Of the above, Nurul Huda (Light of Guidance) and Risala-e-Roohi (Book of Soul) are the most popular, along with the poetry collection Abyat-e-Bahu.